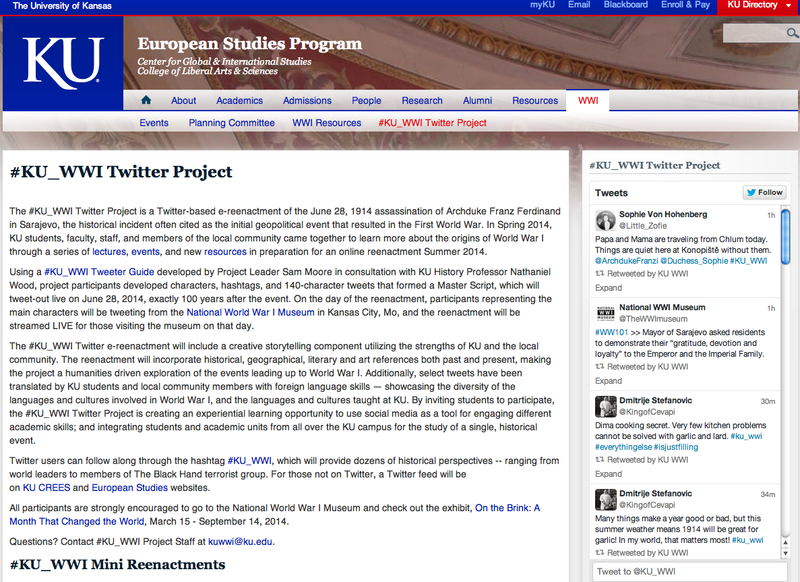 Interested in the @KU_WWI Twitter Project? Want to participate? Throughout the month of April we’re having an open casting call where all tweeters are welcome! Everything you need to participate is available to download on the #KU_WWI Twitter website. You’ll find directions, how-to guides and more! You can also access the #KU_WWI Tweeter Guide online. Try to view this guide as a place to start. If there’s a particular character or element of the event that you find interesting, do a little more research online or with books we cite in the guide. The National World War I Museum is also an excellent resource. We highly recommend you visit their new exhibit, On the Brink: A Month that Changed the World. Work alone or work in groups, and just have fun! Pro-tip: use the skills you already have. If you’re a theater person, add some theatricality to your tweets. If you’re good with geography and maps, tweet some good links. Know about East European culture? Fill us in! If you’re a history buff, a strong chronology of events would be appreciated. Know a foreign language? Translate the tweets for yourself and others! Think of this project as a performance piece using all the academic and creative skills you have to offer. Do you have to be a member of the KU community? Absolutely not! Invite any and all who might be interested to participate — the more the merrier. The project is a collaboration among the Center for Russian, East European & Eurasian Studies, the Ermal Garinger Academic Resource Center, European Studies Program, the departments of Germanic Languages & Literatures, History and Slavic Languages & Literatures, University Honors Program, Center for Global & International Studies, Global Awareness Program, Hall Center for the Humanities, KU Libraries, KU Memorial Unions and Spencer Museum of Art. This project is also sponsored by the National World War I Museum at Liberty Memorial in Kansas City. The KU Center for Russian, East European & Eurasian Studies (CREES) announces a new educational outreach initiative utilizing KU students, resources, and social media to explore history related to World War I. 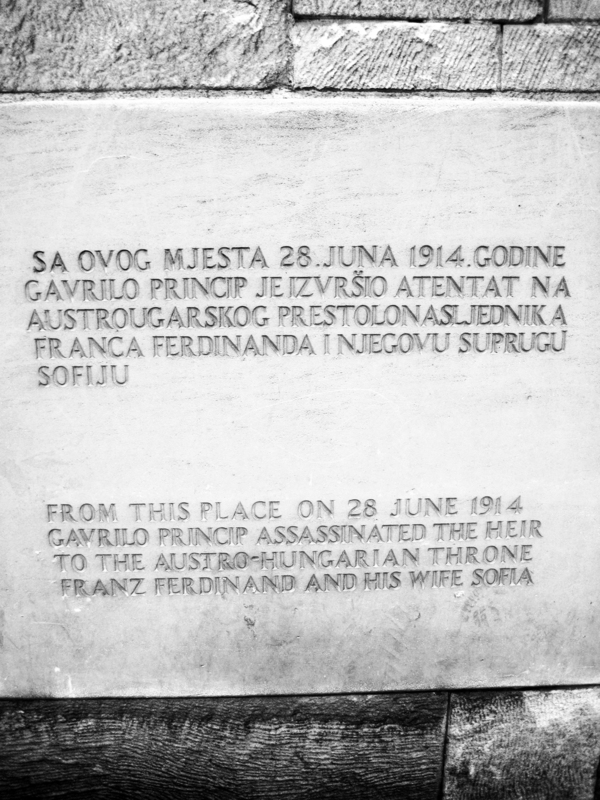 The #KU_WWI Twitter Project is a Twitter-based e-reenactment of the June 28, 1914 assassination of Archduke Franz Ferdinand in Sarajevo, the historical incident often cited as the initial geopolitical event that resulted in the First World War. KU history student, Sam Moore (BA ’13), has been hired by the KU Center for Russian, East European & Eurasian Studies (CREES) to serve as the #KU_WWI Twitter Project Leader. Working closely with CREES Outreach Coordinator Adrienne Landry, Sam has developed a “#KU_WWI Guide” for understanding the historical event and the overall project. The guide, along with supplemental imagery, web resources, and maps, will be used at two “Call for Tweeters” (April 9th and April 30th, see flyer for more details). The Call for Tweeter events will be forums where KU students, faculty and staff can learn more about WWI and the assassination of Archduke Franz Ferdinand, and have an opportunity to become Twitter e-reenactors. They will use the “#KU_WWI Guide” to develop e-reenactment characters, twitter handles and hashtags, and 140-character tweets reenacting the assassination. Tweets created by students, faculty and staff at the Call for Tweeter events will be selected by project staff to form a Master Script, which will tweet-out live on June 28, 2014, exactly 100 years after the event. The public will be able to follow along on the @KU_WWI Twitter site, through the hashtag #KU_WWI, or through Twitter feeds on the crees.ku.edu and european.ku.edu websites. 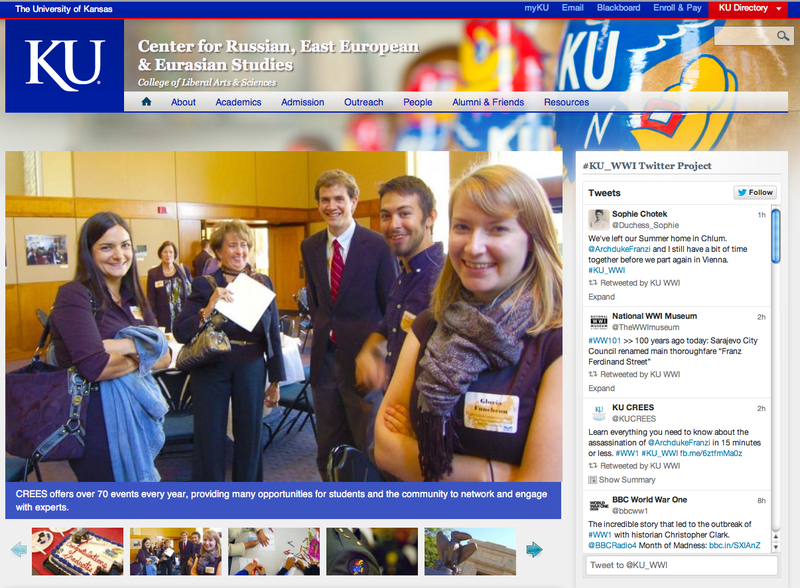 Through this type of compelling storytelling and the interactive nature of Twitter, the project will: connect faculty and students on the KU campus with ideas, places, and history from across time and generations; engage students in discussions about this humanities theme and topic; integrate classroom learning with a campus-wide extracurricular activity; promote world languages and literatures taught at KU; offer multiple points of view for the general public to consider; and strengthen a sense of community for the KU WWI Centennial Commemoration 2014-18. Slavic Languages and Literatures Instructor Marta Pirnat-Greenberg has dedicated a week of her class, BCRS 208: Intermediate Bosnian-Serbo-Croatian, to translating select tweets from the project’s Master Script. By incorporating the project into her curriculum, BCRS 208 students will use their language skills, develop translation techniques, and learn about an historical event that affected the culture of the language they are studying. These translations will be incorporated into the overall Master Script. While BCRS 208 is vital to the project (the event took place in Bosnia and the language of many of the main characters was Serbo-Croatian), other languages will be utilized as well. Tweets will be translated into German, Russian, Czech, French, and many others – showcasing the many languages taught at KU. Copies of the anti-WWI satirical novel, The Good Soldier Švejk will be on-hand at the Call for Tweeters. This work will be heavily referenced throughout the e-reenactment, adding a strong literary perspective. Copies of the work will be available in the original Czech as well as German, Russian, and English. By using this novel to add a literary perspective to the e-reenactment, participants will enhance their world literature knowledge as well as engage their foreign language skills. The first #KU_WWI Call for Tweeters will be on April 9 at 7 p.m. in the Malott Room of the Kansas Union (6th floor). The second will be held on April 30 at 7 p.m. in Alderson Auditorium of the Kansas Union (4th floor). KU students, faculty, staff and members of the local community are welcome to participate in one or both of these events. Participants are encouraged to bring laptops. Snacks and door prizes will be available for participants.